What all our CAMELOT clients have in common is the overall company target of increasing return on investment (ROI). They strive to reduce stock and minimize costs while increasing customer service. In order to support the company’s strategy, objectives are usually broken down to the individual functional departments. The wide spread truth in every industry is that operational efficiency improvement is obtained by minimizing costs. The relation of unit costs and ROI is not questioned and thus decisions are made based on costs within every department. The resulting silo-optimization jeopardizes overall company’s performance due to conflicting and misleading metrics. 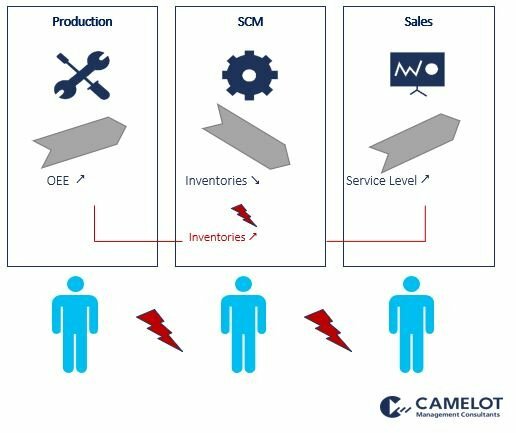 This reality is illustrated in figure 1 depicting three typical metrics of the production, SCM, and sales departments. To understand this controversy, we need to point out some examples for conflicting metrics as well as misleading decision-making processes. The Overall Equipment Effectiveness (OEE) represents the operational effectiveness of a resource by considering losses concerning availability (downtime), performance (speed) and quality (defects). The manufacturing department is often measured by OEE achievement and thus tries to direct the production rate to be as high as possible. The often-underestimated problem is that it doesn’t pay to reach high OEE utilization while producing units that are not demanded by the customer. Having too much of the wrong and too little of the right is a problem that most demand planners know very well. The most common conflicting supply chain target is the inventory reduction target while requiring a high customer service level and OEE optimization. Inventory managers are often measured by inventory levels, i.e. inventory holding costs. Obviously, their target is opposed to the target of increasing output. Thus, the inventory reduction target is a direct counterpart to the improvement of OEE. For the sales and marketing department, lost sales, backorders and unhappy customers are the worst-case scenarios. As they are often measured by sales volume, market share and customer satisfaction, target number one is product availability and quality. Of course, high output rates, thus OEE and great inventories are very welcome. Consequently, limited product availability due to inventory targets often lead to intensive discussions and frustration between sales and SCM. Furthermore, marketing and sales wish to be flexible within their product portfolio, especially for exotics, which causes the need for small lot sizes which is a contrary goal to production. Goals like “ROI Maximization” are not suitable for daily operational decisions! Most companies do not realize that the information to be used in the strategic, tactical and operational planning area is very different, e.g. forecasts are relevant in the long range, not in the short range and the inclusion of fixed costs is not relevant for short-term decisions. Classic KPIs such as unit price, unit cost etc. are unsuitable for decisions in shorter periods. They may be justified in long-term contexts – e.g. when talking about portfolio decisions. It is however common practice to consider all aspects which have driven a strategical decision (e. g. to invest in a new machine) in daily operations. It just feels unjust to the strategy to leave the depreciation for a brand-new piece of equipment out of calculations – but the truth is: It is impossible to “improve” a strategic decision on the operational level. The value in improving the OEE of a machine is in the additional (cash) revenue this generates, not in that the depreciation (which is a constant and non-cash “expense”) is arithmetically spread over a larger volume of product. In summary, conventional metrics do not focus on relevant information, generate conflicts and cause self-imposed supply chain disruptions. They are mainly focused on unit cost optimization and depiction of isolated targets disregarding relevant determinants of overall supply chain optimization. The complexity of today’s supply chains forbids these local optimization measures and metrics, especially if they are cost based as they will in fact obstruct the attainment of a global optimum. The need for transformation of conventional metrics to “smarter” ones is inevitable. 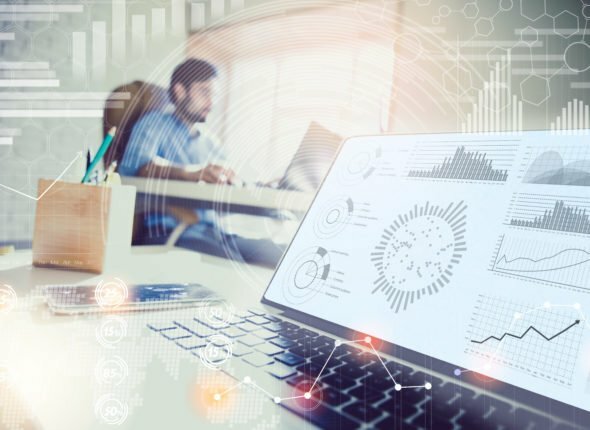 How smarter metrics can lead us into the right direction of performance management will be described in my next blog post. In order to shorten the waiting time, I can recommend you to read about the Demand-Driven Adaptive Enterprise (DDAE) in the meantime as it offers a new comprehensive methodology of MRP that addresses the issue of flow and may lift up your supply chain.